A Family Living in the Mekong Delta in Vietnam. Jean Koo photo. I fell in love with the idea of Vietnam after watching The Scent of Green Papaya almost 15 years ago. Low wooden houses with walls that outline rather than separate inside from outside, tile floors meant for bare feet and leftover architecture of last century’s French influence. I imagined, of course, the scent of green papaya, tapioca, spicy fish, lemongrass tofu, the racy-tang of small crab stir-fry with tamarind and other things that flare the nostrils and water the tongue. 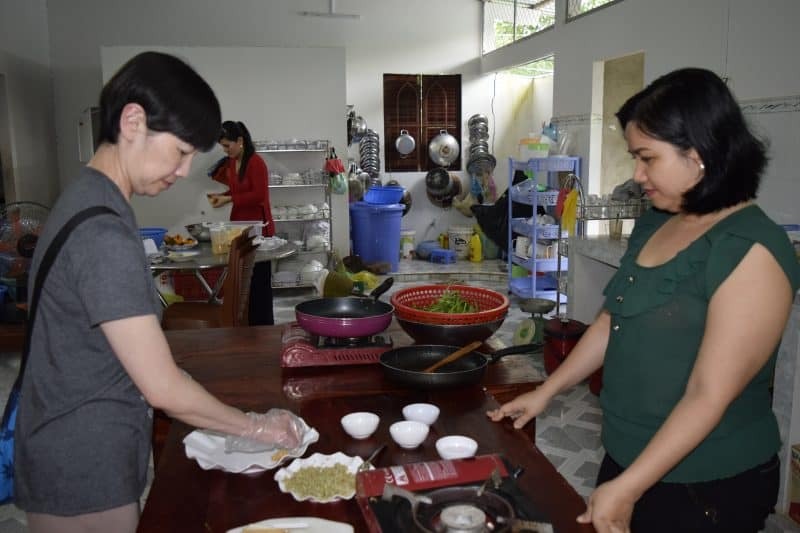 Since food is a major theme in the movie, I thought the best way to experience Vietnam as portrayed in the film is to venture to the Mekong Delta, go grocery shopping and take a cooking class. The excursion cost $80 USD and pick up is in front of the Ho Chi Minh Hotel in Ho Chi Minh City - formerly Saigon. Lou, the driver/tour guide, picked me up at 6:30 a.m. and we began our drive to where the gritty water of the delta begins slipping into the South China Sea. The 235 kilometer-round trip includes a visit to Cai Be Floating Market and The Mekong Marketplace, cooking class and lunch. Lou speaks good English, beautiful French and was very insistent that I accept his gift of bottled drinking water and a wet towel. From the city to the coast, dull paved highways give way to pebble-dirt roads. On these narrow streets, our car slowed to avoid dogs, caravans of bikes, hopping roosters, pushcarts and other things on legs and wheels. 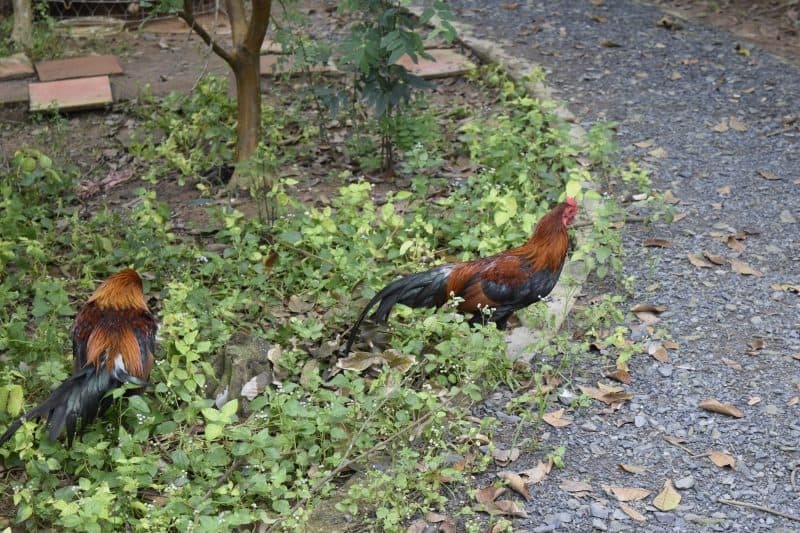 I peeked through bamboo fences and saw comfortably clustered courtyards encompassing several generations gathering around large tables topped with food. The Vietnamese are, as Lou tells me, all about family. Traveling the delta is usually done on long boats with deck chairs invisibly, somehow, anchored to the floor flanked by orange colored life-vests. Since December is low season, I had the boat to myself. Lou told the captain, Sang, in elegant Vietnamese words that I was going to a cooking class. We headed downstream to the floating market for groceries. The sky and the water are gray, the temperature is about 27 degrees Celsius and the breezy is sticky. A bunch of bobbing boats signaled the drifting location of Cai Be Floating Market. 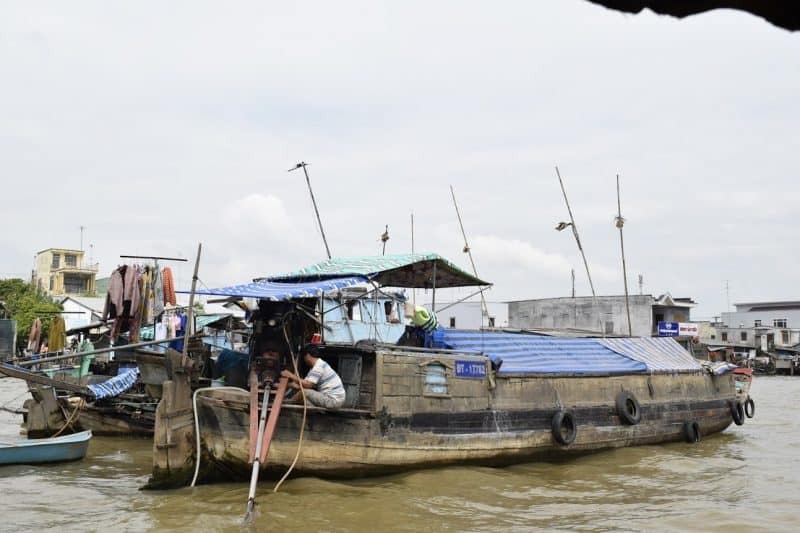 Vendors not only sell their stock on the boats but live on flat bottom sampans year-round. To see the marketplace at it most bustling time, arrive before 9 a.m. Although there is a tourist trade here, there is still something authentic about the market. The boats have been repaired several times over with rough wood, colorful plastic sheets dulled by sun and rain shelter the decks, modest clothes hang from long poles to dry and air, small children eat rice from their mother’s fingers – there is no bling or glint of pretense. I have fallen into another way of life, and it is a very old and established way of living. Under Sang’s instructions, I purchased lemongrass, flat fish, and a whole, a plastic bag of what appears to be chopped shallots/onions/garlic/red pepper for seasoning and mint leaves. I also got a meaty yellow wedge of durian wrapped tightly in plastic to contain the distinctive aroma. This snack is for Lou who told me this region grows the best durian. Total cost, not sure. I gave the woman in a faded blue hoodie, zipped up to her chin, 3USD and was given a lot of colorful Vietnamese dongs back as change plus a large, almost bald, coconut with a straw protruding out of the top for refreshment. It struck me that I was actually interacting with the people the who farm, fish and gather the food I was about to eat. 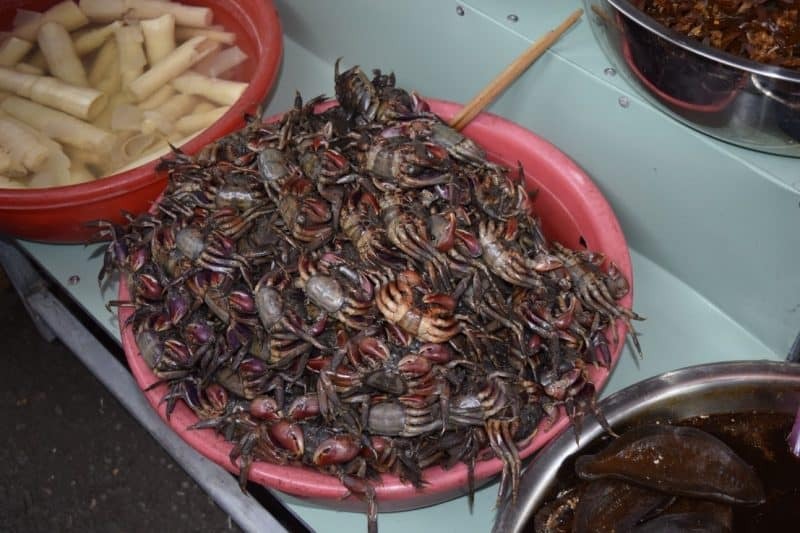 Small crabs for sale in the market in the Mekong Delta. Sang maneuvers our boat bumplessly away from Cai Be and we move with the current for several minutes along a coast lined with 1-3 story buildings – conditions vary from very new to falling down – all on stilts and most with aluminium roofs. We pull next to three black logs, fastened together, servicing as a dock. 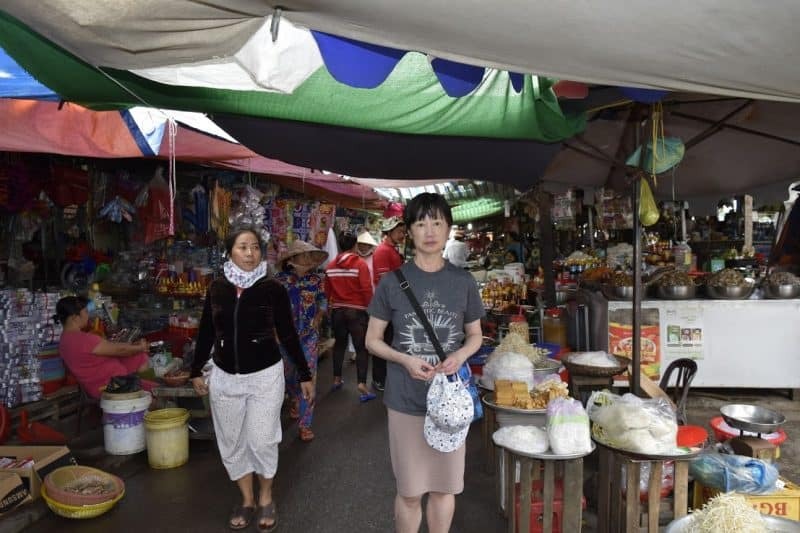 A canopy of plastic sheets sheltered the marketplace from the mix of prickling sunlight that was starting to emerge and droplets of rain that were beginning to fall. A mass of happy colors in one section offered raincoats, toys, buckets, school supplies and other daily items for sale. Crabs with kicking legs, spongey tripe, noodles of different widths and vegetables clinging to soil share laneways with beige colored tofu sinking in tubs of not so clear water. Around the spice stalls, the scent was thick and I could taste the aroma at the back of my throat. I bought hard tofu, stalky greens bearing long willowy roots, rice paper and vermicelli –- again cost unknown but under 2USD. Returning to the water, I left Sang and boarded a small sampan for a ride into one of the tributaries jetting inland from the Mekong. A woman standing on the back-deck steered and paddled me along a canal. This waterway was flanked by dense, leafy trees with tangled trunks and numerous shrines offering respect to different gods, deities and the much loved and admired Goddess of Mercy. I arrived at a pathway with my groceries and give the woman 1USD tip. She gave me a gummy smile. The cooking lesson was in an open kitchen kept cool by ceiling fans and doorless entryways. Stephanie, my teacher, and I unraveled the groceries and washed the vegetables in a tub of clear, cool water – just like in Scent of Green Papaya!! Slicing tofu, breaking the roots from the greens, soaking vermicelli, scaling the fish – Linh did that part - we get the prep-work out of the way. Cooking is done on skillets on top of butane burners. Most everything is stir-fried or fried in oil. 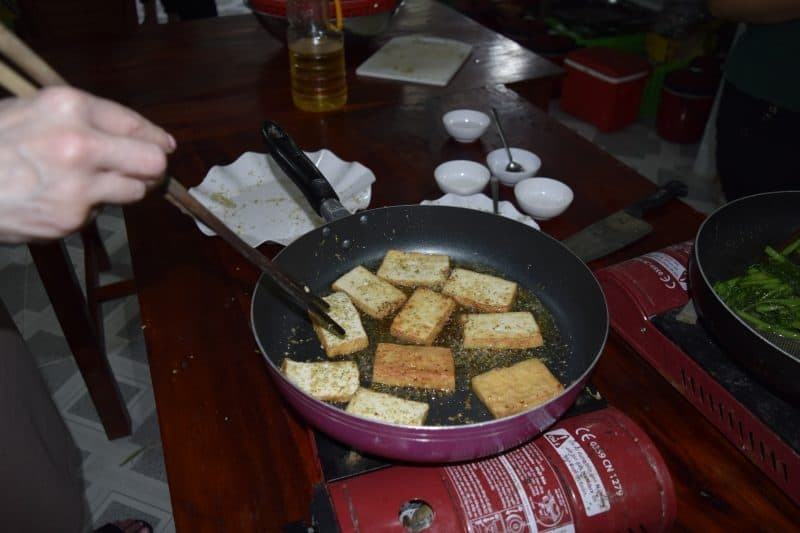 Cooking tofu during the cooking lesson. With the help of Linh, we brought the food to a shaded veranda overlooking the Mekong. I commenced eating and discovered that the work in the kitchen is only part of the preparation. A lot depends on how you assemble the food at the table. The meat is pulled off the fried fish and with the vermicelli and mint leaves are wrapped with soften rice paper to be dunked in fish sauce before eating. Tofu and vegetables are to be eaten with rice. Soup with chunks of chicken and celery – made ahead of time by Stephanie – was served at the end of the meal. This liquid yumminess was encouraged to be poured into the remaining rice to create a porridge. Drinks, including 333 Beer/Saigon Beer/Hanoi Beer/7-Up/Pepsi – no diet version of anything, are included. Dessert is a tray with mango, dragon fruit and pineapple. The food tasted earthy and despite the bag of freshly chopped seasoning, unhampered. Fish tasted like fish and riverbed, vegetable tasted like greens heavy with oil, the rice tasted of rice and husk – it was a meal in which all the ingredients are distinguishable and no doubt came from or near the delta. The lunch had a home-cooked quality about it. I EAT A LOT – I MEAN REALLY, REALLY A LOT. After lunch, Linh brings me to see her beehive and gives me two packets of honey candy to take home. I realize that I love The Scent of Green Papaya because is a movie about human interaction, the love of cooking and the enjoyment of food. 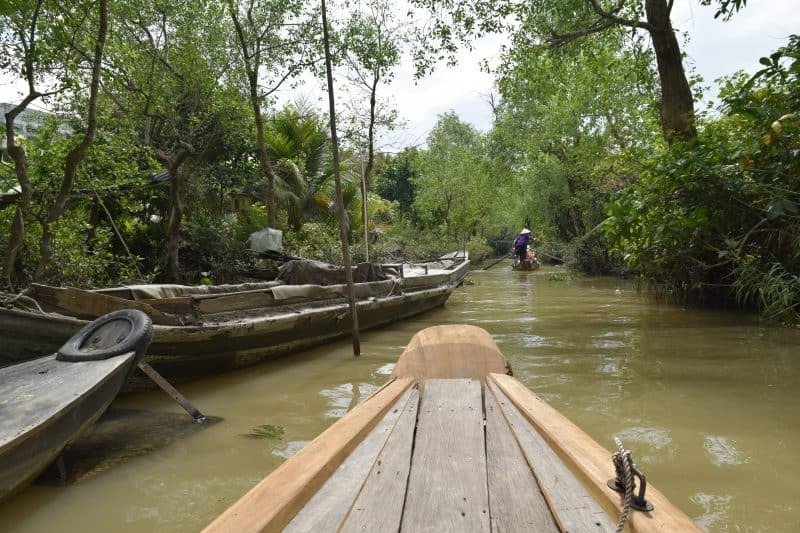 Such is the same with this experience on the Mekong Delta. Jean Koo lives in Toronto, Canada. She works as a corporate editor, holds a PhD. in the history of astronomy and is an aspiring travel writer.